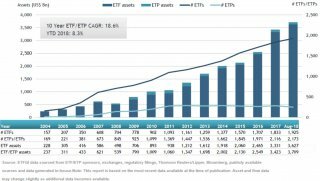 ETFGI, a leading independent research and consultancy firm covering trends in the global ETF/ETP ecosystem, reported that ETFs and ETPs listed in the US reached a new high of US$3.71 Tn in assets, following net inflows of US$24.71 Bn in August, according to ETFGI’s August 2018 US ETF and ETP industry landscape insights report, an annual paid-for research subscription service. “On August 22, 2018 the S&P 500 marked its longest bull market - 3,453 days, without a bear market - a 20% drop from the index’s 52-week high. August was a strong month for U.S. equities with economic strength and strong corporate earnings pushing the S&P 500 to reach record highs and gain 3.26% during the month and up 9.94% year to date. Most non-US markets suffered declines during August due to investors’ concerns over trade tensions, Brexit, currency crises and a fear of contagion. Developed markets ex US declined 1.44% in August while up 0.46% YTD, EM markets were down 3.51% and are down 0.81% YTD and Frontier markets were down 4.50% and are down 1.66% YTD.” according to Deborah Fuhr, managing partner and a founder of ETFGI. 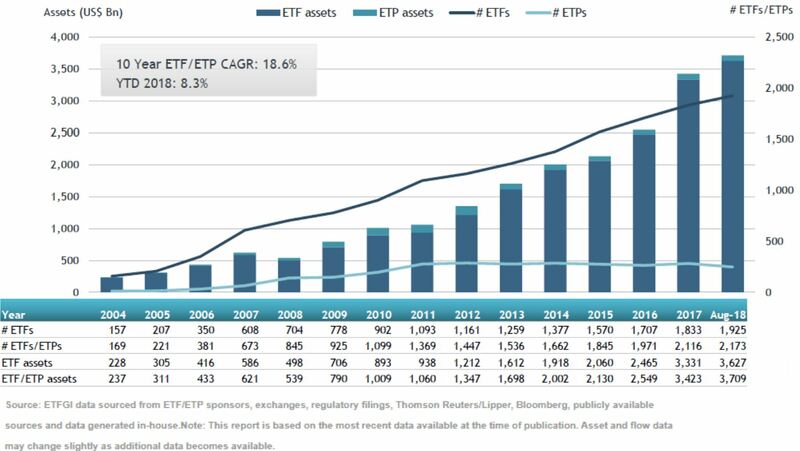 At the end of August 2018, the US ETF/ETP industry had 2,173 ETFs/ETPs, assets of $3.71 Tn, from 143 providers listed on 3 exchanges. Due to net inflows and market moves the assets invested in ETFs/ETPs listed in the US increased by 2.11%, from $3.63 Tn in July 2018 to $3.71 Tn. Growth in US Listed ETF and ETP assets as of the end of August 2018 Equity ETFs/ETPs listed in the US gathered net inflows of $19.67 Bn in August,?bringing net inflows for 2018 to?$109.44 Bn, less than the $200.41 Bn?in net inflows at?this point last year.? Fixed Income ETFs and ETPs listed in the US gathered net inflows of?$4.90 Bn in August,?growing net inflows for 2018?to $51.50 Bn, less than the $84.34 Bn?in net inflows at this point last year.? 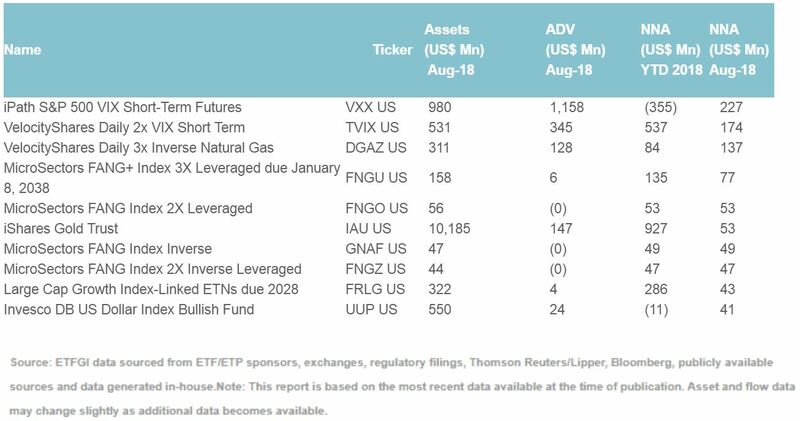 Commodity ETFs/ETPs listed in the US saw net outflow of $2.59 Bn in August,?bringing net outflows for 2018 to?$3.55 Bn, greater than the $265 Mn?in net outflows at?this point last year. 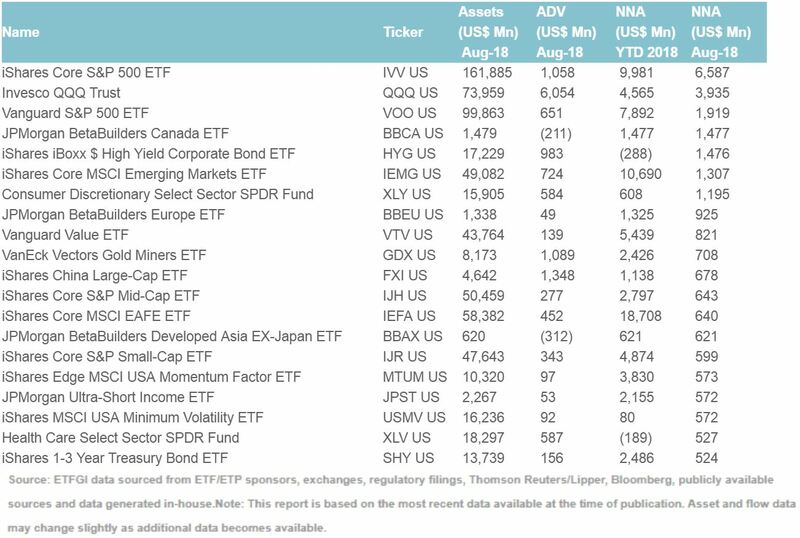 A large proportion of net inflows in August can be attributed to the top 20 ETFs by net new assets, which collectively gathered $26.30 Bn. 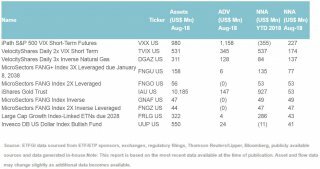 The iShares Core S&P 500 ETF (IVV US) gathered $6.59 Bn the largest net inflows in August. 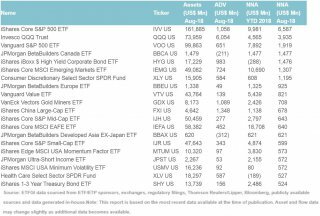 Top 20 ETFs by net new assets August 2018: US The top 10 ETPs by net new assets collectively gathered $899 Mn by the end of August 2018. Top 10 ETPs by net new assets August 2018: US Investors have tended to invest in core, market cap and lower cost ETFs in August.